If you get the chance to travel to Santiago, you HAVE TO go to Emporio La Rosa ice cream place. 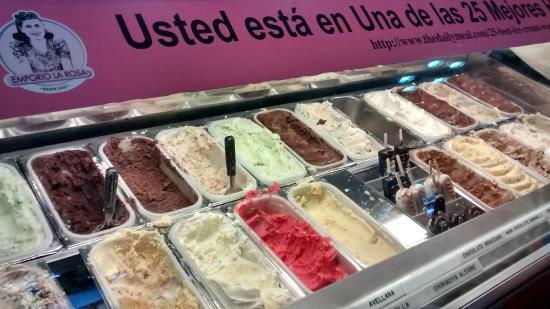 It is a Chilean company and their ice-cream is ranked in the best 20 in the world. Their ice cream is phenomenal. 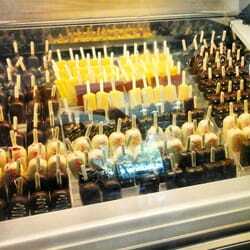 They had around 40 different types of ice-cream and it was not too expensive as one would expect from place like that. Probably the flavor that surprised me the most in a good way was leché y arroz (milk and rice). You would think that this combination does not go together, but it was really delicious. Also, any other fruit flavors were amazing as well. They are not only making “regular” ice cream like we are used in the U.S. or like is on the picture above. They make these things as well. It is their ice cream, but frozen on a stick. In my opinion this is even more dangerous because it allows them to dip their ice cream into whole types of chocolates and sweet sauces with fresh fruits. So basically, you have an ice cream that one for the best in the world, dipped in milk chocolate, with white chocolate stripes and pieces of strawberry on top of it. Luckily, I saw these stands only in shopping malls.